Guess what guys...this is Issue #100! This weekly cryptocurrency newsletter has certainly come a long way since I started Issue #1 in late 2013. 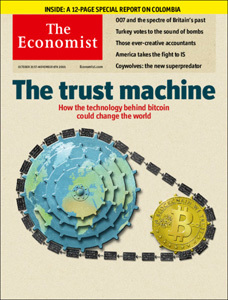 And I would say Issue #100 came at a very opportune time as The Economist decided to feature Bitcoin on its front cover this week! Pablo Sanzo shares his thoughts about why The Economist is still not getting it 100% right on the potential of a truly decentralized currency. Growth in venture capital flowing to bitcoin startups slowed substantially last quarter, and startups are feeling the pinch. San Francisco-based blockchain startup Blockstack.io has entered into an acquisition agreement with Digital Asset Holdings. Barry Silbert's new Bitcoin company raised an undisclosed sum from traditional financial firms and venture investors, many of whom have not invested in a digital currency company before. Distributed ledger startup R3CEV has added an additional three banking partners, raising the number of total banks involved to 25. Almost a year ago, BitScan talked to Og Nasty, who runs a mining pool with a difference. The author figured it was time to catch up again and get his take on where things are at. Chris Shepherd, CEO of HashRabbit shares his insights in Bitcoin mining. Paul Sztorc makes some arguments on how Bitcoin's block reward halving should be smoothed out to help out miners. There is a race to regulate Bitcoin. Is it too soon? 'Bitcoin at the crossroads' examines three reasons why US policy makers and regulators may want to consider giving Bitcoin more time to develop. In a new paper presented this month at CCS, Provisions, the first cryptographic proof-of-solvency with strong privacy guarantees is presented. The protocol hides the total assets and liabilities of the exchange, proving only that assets are strictly greater than liabilities.